Our intention is to give proper representation for women and backward classes, said Rahul Gandhi, the congress General Secretary while interacting with the students. There is no sufficient infrastructure available to ensure proper education to all, he added. “What we are trying to do is open the doors of politics to all so that anyone can come on their merit without any support or recommendations. That is what we are trying to do in YC and NSUI” said Rahul Gandhi. Priyanka Gandhi has a special place in the hearts of the people, especially in Amethi and Raebareli, the parliament constituencies of her brother Rahul Gandhi and mother Sonia Gandhi respectively. Wherever she goes, people shower a lot of affection and love towards her. Priyanka Gandhi also shows the same feelings a to the people, in return. It is the people who make a leader, Priyanka Gandhi Vadra always reminded people. Once again expressing his displeasure for not delegating power to panchayats in some of the states, Congress General Secretary Rahul Gandhi declared that he would fight for empowerment of the panchayat bodies. Rahul Gandhi always believed that country can not develop till democracy reaches the grass root and it will be possible if panchayats were given proper power and authority. During the recent interaction with the panchayat representatives in Ranchi, Rahul Gandhi expressed his concern for the fact that panchayat members are not getting required power. "Rahulji was disappointed when he learnt that panchayat bodies have not yet got any power to execute developmental works," Congress leader said who had attended the interactive session said. Jharkhand Youth Congress President Jai Mangal Singh attended a separate meeting in Bokaro, said, "Rahulji told us he would fight for the rights of panchayats after he learnt that devolution of powers has not yet taken place in Jharkhand." Your MP Sonia Gandhi has been putting in her sincere efforts for the development but the state government creates hurdles, said Priyanka Gandhi Vadra in Raebareli. She explained about the electrification works done by the initiative of Sonia Gandhi in the region as well as the efforts for the Railway coach factory. It is the people who make a leader, said Priyanka Gandhi Vadra in Raebareli. Politics means service and it is not a business, she added. There is no sufficient infrastructure available to ensure proper education to all, he added. We need more and more good institutes, said Congress General Secretary Rahul Gandhi. “What we are trying to do is open the doors of politics to all so that anyone can come on their merit without any support or recommendations. That is what we are trying to do in YC and NSUI” said Rahul Gandhi. Embarrassing the BJP party and leadership, its senior leader and former Karnataka chief minister B.S. Yeddyurappa heaped praises on the Nehru-Gandhi family and lashed out at his own party chief Nitin Gadkari and veteran leader L.K. Advani. “The Congress leadership from Pandit Nehru to Sonia Gandhi did not go back on their promises to their party leaders" said Yeddyurappa. "This quality needs to be appreciated," he told reporters in Bangalore as Gadkari and other BJP leaders attended the last day of a party meet in Surajkund in Haryana. "Till Atal Behari Vajpayee's time, this was the case in BJP also. But not now," BSY added. An immediate fallout of Yeddyurappa's outburst appeared to be the BJP leadership dropping plans to name a successor to incumbent state unit chief K.S. Eshwarappa, whose term ends this month-end. The timing of his comments is very important. He has praised Congress President and Congress party at a time when the BJP’s national executive is underway in Haryana. Congress General Secretary Rahul Gandhi, who was on a two-day visit to Jharkhand, urged the party leaders and workers in the state on Thursday to give up factional politics which was harming the party interests in the state. "Rahulji told us that there is groupism in the state Congress party. Had it not been there the Congress strength in Jharkhand assembly would have been 25 to 30 MLAs," an AICC member, who attended a party meeting chaired by Gandhi here, said, quoting him. Earlier addressing Youth Congress leaders, Rahul Gandhi called upon them to work earnestly so that the people threw out the present government and vote the Congress to power in Jharkhand. The Congress General Secretary called upon the youth Congress leaders to be fearless and overcome all difficulties in strengthening the party. Rahul Gandhi was on a two-day visit to the state to rejuvenate the Congress ahead of the next general elections. He also held meetings with the Congress workers from top to bottom and listened to their problems seriously. Congress General Secretary Rahul Gandhi is interacting with the students. He said that we need more and more quality institutes to provide better education. There is no sufficient infrastructure available to ensure proper education to all, he added. We need more and more good institutes, said Rahul Gandhi. “What we are trying to do is open the doors of politics to all so that anyone can come on their merit without any support or recommendations. That is what we are trying to do in YC and NSUI” said Rahul Gandhi. Congress President and UPA Chairperson Sonia Gandhi is addressing the function to inaugurate the new Ryan International school in Raebareli. Sonia Gandhi expressed hope that the people of Raebareli will be able to get better education now and she also appreciated the Ryan school management for the efforts to improve the quality of education. Priyanka Gandhi Vadra slammed the non-Congress UP government for creating obstructions for the development works initiated by Congress President and MP Sonia Gandhi for Raebareli. ‘Your MP Sonia Gandhi has been putting in her sincere efforts for the development but the state government creates hurdles’, said Priyanka Gandhi Vadra in Raebareli. She explained about the electrification works done by the initiative of Sonia Gandhi in the region as well as the efforts for the Railway coach factory. Congress President and UPA Chairperson proved once again that welfare of aam aadmi is her most important concern. While initiating the schemes like MNREGA, RTE, RTI and food security bills, she has now asked the Central government not to increase the price of sugar distributed under the PDS system. A meeting of the Congress core committee headed by Sonia Gandhi asked the government to put off the decision as of now. Despite Prime Minister Manmohan Singh argued in favour of increasing the sugar prices in the meeting and pointing out that the government has to cut the subsidies to reduce the fiscal deficit, Sonia Gandhi was not in favour of such a move at present. She was always concerned about the poor and underprivileged. Their pain was her pain. When a massive earth quake jolted Jammu Kashmir, she took time to reach there without any delay to console the victims and extended all her help and support to help the affected people. She expressed her concern and pain when a drastic Tsunami hit Indian coastal areas. Her deep concern for the aggrieved was also seen during the flood in Gujarat, Maharashtra and Himachal, during the terrorist attack in Delhi as well as when a number of persons were killed during the recent riots in Assam. For Sonia Gandhi politics is not power but a way to serve the people. The perfect example is her refusal of the post of Prime Minister when UPA was voted to power. “I always listen to the voice of my inner conscience. I have said on many occasions that my target is not the Prime Ministership. Today my inner conscience tells me to politely refuse the post” was the statement by the Congress President when asked about her turning down the post of Prime Minister. Yes Sonia Gandhi is always concerned for the common man and welfare of aam aadmi has always been her mission. As the UPA chairperson Sonia Gandhi was instrumental in framing the policies like MNREGA, RTE, RTI and her next target is to get the Right to Food Bill is passed. Sonia Gandhi has been putting in her all sincere initiative for more important schemes and policies for the welfare of aam aadmi. “Rajiv Gandhi had a great vision to improve the quality of education especially in villages. That is why he implemented the Navoday Vidyalay scheme”, said Congress President Sonia Gandhi. The Congress-led UPA government also having the vision to improve the primary and secondary education in our country and the government has been making policies in this direction, said Sonia Gandhi. The people in the villages have the real strength. And we should go to them to realize this strength, said Congress General Secretary Rahul Gandhi in Lucknow. The Congress-led UPA government at the centre has been sending huge amounts of funds for the development of Uttar Pradesh. But the money vanishes and does not reach the beneficiaries, concerned the Congress MP from Amethi. It is our moral responsibility to ensure that every girl child also gets proper education like boys, said Congress President and UPA Chairperon Sonia Gandhi in Raebareli. While talking at the inaugural function of Ryan Public School in the region Sonia Gandhi said that country can not surge ahead if the women remain backward. Empowerment of women is important for development, said the Congress MP from Raebareli. Congress President and UPA Chairperson Sonia Gandhi has been managing the Congress-led UPA government at the centre very effectively. Her effective intervention has helped the government to solve a number of issues. Further, as the chairman of NAC, Sonia Gandhi played important role to frame the policies like MNREGA, Right to Education, Right to Information and Sarva Siksha Abhiyan. Members of the Congress Working Committee members met at the residence of the Congress president Sonia Gandhi on Tuesday to review the political situation after the announcement of economic reforms announced by Prime Minister Manmohan Singh last week. 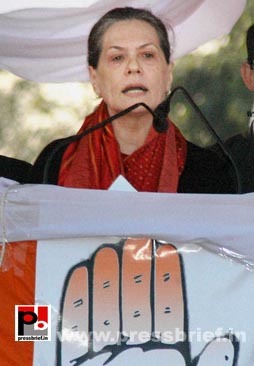 Congress President Sonia Gandhi said that the tough decisions were the need of the hour. She also attacked the BJP for playing "negative politics. While stressing the urgent need to improve the economic situation, she said "new allies" will move in. 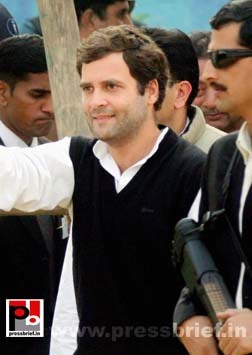 Rahul Gandhi raised the issue of killing of panchayat members in Jammu & Kashmir. He said one should take note of the fact that non-implementation of panchayat raj in the state is behind the killings. The Nehru-Gandhi family always stood for the country and worked sincerely for its development. From Motilal Nehru to young generation members like Rahul Gandhi and Priyanka Gandhi, their services for the country as well as for the Congress party are unmatchable. The present Congress President Sonia Gandhi also has been performing excellently as the Congress President with an innovative vision and pro-poor ideology. Motilal Nehru, an advocate by profession, in 1921 had submitted before the court while appearing for a case that he gave up his lawyer profession to be engaged in social service. He also had informed that he is leaving the job of a lawyer which, at that time, fetched about Rs. 5 lac per annum. Only a true lover of nation can take such an unbelievable decision- to quit a lucrative profession and work for the nation. After Motilal Nehru, Jawaharlal Nehru, Indira Gandhi, Rajiv Gandhi, now Sonia Gandhi, Rahul Gandhi and Priyanka Gandhi Vadra are all following Motilal Nehru’s footsteps. Addressing a function organized at the Vigyan Bhavan in New Delhi, to commemorate the 150th anniversary of the great freedom fighter Motilal Nehru, Congress President and UPA Chairperson Sonia Gandhi paid rich tributes to the great leader. “Motilal Nehru believed that the county was above any community or sect” said Mrs. Gandhi. She also remembered that Motilal Nehru laid the foundation of modern inclusive parliamentary democracy. The nation on Tuesday remembered freedom fighter and former Congress President Pandit Motilal Nehru on his 150th birth anniversary. Addressing a commemorative function organized at the Vigyan Bhavan in New Delhi, Congress President and UPA Chairperson Mrs. Sonia Gandhi paid rich tributes to the great freedom fighter. “Motilal Nehru believed that the county was above any community or sect” said Mrs. Gandhi. She also remembered that Motilal Nehru laid the foundation of modern inclusive parliamentary democracy. The Congress President asked the countrymen to counter the extremist and deviant forces that are challenging well laid-out democratic values of equality and social justice. “Motilal Nehru was a committed soldier to freedom struggle and was twice president of the Indian National Congress. Sadly, Motilal Nehru did not live to see India achieve independence. But his love for India manifested itself in his ability to shed the trappings of material and professional success; indeed his all way of life and devoted his later years to that goal. Apart from his legislative works he laid great stress on communal harmony and national unity” said the Congress President. Sonia Gandhi said further “Staunchly secular, he always believed that communal passions are inconsistent with the true spirit of religion or the traditions of our country. History’s his singular contribution that can be laid at his doorstep it is the visions spelt out in what has passed into history as the Nehru Report of 1928 which he authored”. “Our modern inclusive parliamentary democracy owes much to this seminal document which outlined a system of government in which all could vote and all could be free to practice the faith. It laid the foundation for equal rights of men and women, for fundamental rights for all, for directive principles and the Supreme Court. All these have been already incorporated into our constitution” added Sonia Gandhi. Sonia Gandhi recollected that Motilal Nehru never bowed to the sentiments of caste, sect or community which were being propagated by his opponents. “This was unthinkable for him. He firmly believed that country is above any community or sect” she added. Congress General Secretary Rahul Gandhi who was on a visit to Lucknow expressed his concern over the fact that the state of Uttar Pradesh has been slipping down while all other states are surging ahead. The Congress-led UPA government at the centre has been sending huge amounts of funds for the development of Uttar Pradesh. But the money vanishes and does not reach the beneficiaries, concerned the Congress MP from Amethi. Congress General Secretary Rahul Gandhi always believed that the development would be complete when we eradicate poverty from the country. The real strength is in the hands of the poor in the villages he always said. Rahul Gandhi always focused on the issues related to the upliftment of the underprivileged and downtrodden. RANCHI: All India Congress Committee (AICC) General Secretary and Congress Member of Parliament Rahul Gandhi will arrive in Jharkhand on Tuesday on a two-day visit to revive the party at grassroots level ahead of the next general elections. The Congress leader will interact with party workers right from panchayats to state levels and chalk out a strategy to strengthen the organization. Party spokesperson Shakeel Ahmad, who has already arrived in the state to oversee the preparations, said Rahul Gandhi's visit would boost the morale of the Congress workers in the state. "The general elections - Lok Sabha and Jharkhand assembly - are due in 2014 and as a national party we need to strengthen the organization. I am sure that visit of Rahul Gandhi, who helped increasing the vote percentage in Uttar Pradesh, will also prove beneficial for Jharkhand," said Ahmad. Rahul Gandhi would reach Ranchi in the morning and pay tribute to Birsa Munda's statue near the airport. Later, he will interact with block and district presidents of the Congress party in Doranda and panchayat leaders in Namkom. On Wednesday, Rahul Gandhi will visit Bokaro, where he will hold meetings with members of the state executive committee and with leaders of the youth wing of the Congress. “Indira Gandhi also was having the vision that technology and industries should reach the villages. Then only the development will be complete. Then only unemployment issues can be resolved” said Congress President Sonia Gandhi while addressing a Congress rally in Manakpur. Sonia Gandhi also unveiled some of the development projects in the region. Congress President and UPA Chairperson Sonia Gandhi presented the people of her constituency a memorable gift - a degree college for girls in the memory of former Prime Minister Late Indira Gandhi. “Rae Bareli was the Indira Ji’s ‘karmbhoomi’ and it was her wish that a girls’ degree college should be built in her memory,” said Sonia Gandhi in her address after laying the foundation stone for two road projects in her constituency. During her two-day visit to Rae Bareli, Sonia Gandhi informed that the human resource development ministry has taken an initiative to set up a degree college here. “The state government has also shown positive stand in giving land and as soon as land is provided, the work will begin and the college will be named after Indira Gandhi,” informed Sonia Gandhi. The Congress MP informed that the Congress-led UPA government had taken concrete steps in the field of education. Sonia Gandhi pointed out that approval has been given for one model school in every block for which 75 per cent of the cost is being borne by the UPA government. Sonia Gandhi added that in Uttar Pradesh, money has been provided for 148 schools. The Congress President reiterated that the society and country would progress only when maximum people get educated and also explained that the Congress-led UPA government has been working in this direction because it realizes that the key to a bright future is education. Congress President and UPA Chairperson Sonia Gandhi during her two-day visit to Raebareli, her Lok Sabha constituency, said that the Congress-led central government has taken many important steps to improve the quality of education. "The society and the country will progress only when maximum people get educated. Education is the key to a bright future," said Sonia Gandhi in her address after laying the foundation stone for widening of the Lucknow-Rae Bareli road and other projects. "Approval has been given for one model school in every block and 75 per cent of the cost is being given by the UPA government. In Uttar Pradesh money has been provided for 148 schools," further informed the Congress MP. Sonia Gandhi also told the gathering that the Human Resource Development Ministry has taken an initiative to set up a Girl’s degree college Rae Bareli. "State government has also shown positive stand in giving land. As soon as land is provided necessary steps would be taken immediately and the college will be named after Indira Gandhi," informed Sonia Gandhi. The Congress president also said that work on widening Rae Bareli-Allahabad road would be started soon at a cost of Rs 300 crore. 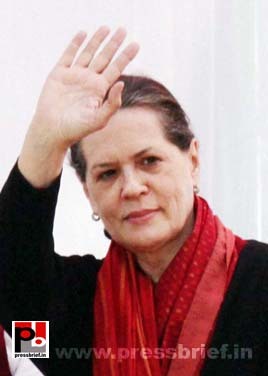 Sonia Gandhi told that the UPA government has given approval for national highway projects at a cost of Rs 1,800 crore. Congress President Sonia Gandhi recalled the contribution of her husband and late Prime Minister Rajiv Gandhi for the revolution in technology in the country. “Today we all are able to avail the benefits of telephone and other communication technologies. This was possible because of the long term vision of Rajiv Gandhi. Similarly country could witness a revolution in information technology also because of Rajiv Ji”, said Sonia Gandhi. Congress General Secretary Rahul Gandhi took on the Odisha Chief Minister Naveen Patnaik for his allegation that Centre has not been sending enough funds to the state. “His claim is not true. Centre has been sending funds but those funds are not being utilized properly in the state and as a result the people are not getting its benefits” said the young congress MP. The conditions in the state are so pathetic like UP, added Rahul Gandhi. Congress President and Raebareli MP Sonia Gandhi during her recent visit to her parliament constituency announced various development projects for the region. While addressing a gathering after laying the foundation stone of the road project of the National Highway 28 between Rae Bareli and Lucknow, Sonia Gandhi informed that she would continue her best efforts for the development in Raebareli. "Zindagi ka silsila nahin rukta hai, nahin desh ke liye kaam karne ka"(Life does not stop, neither does work for the nation)," said Sonia Gandhi, adding that the Congress-led UPA government at the centre had brought out many schemes for the poor and the underprivileged. The Congress MP also said that the real change would come when the education sector gets a major impetus. Sonia Gandhi also announced that a women's degree college would soon be set up in the name of the late Prime Minister Indira Gandhi at Rae Bareilly. Sonia Gandhi also announced other infrastructural projects also for Raebareli including broadening of the railway over bridge at Bachrawan, an overbridge in the city to ease transport and two level crossings at the Kunda bypass. “When am here in Odisha, I just remembered my father Rajiv Gandhi. The last state he visited before his death was Odisha” said Rahul Gandhi while addressing a Congress rally in Odisha. Rajiv Ji had a great love towards Odisha, said the Congress leader. Congress President and Congress Member of Parliament from Raebareli Sonia Gandhi visited her Parliament constituency. She interacted with various Congress leaders and people's representatives who highlighted various issues in the region and sought her help to solve those. She also talked to a number of local residents to know their grievances. The local leaders apprised their MP of problems of drainage, canal and power supply which were causing immense hardships. On the acute power crisis, Sonia Gandhi asked the MLAs to do whatever was required from their side while saying that she would also make efforts in this regard. Sonia Gandhi expressed her unhappiness for the lesser participation of women in MNREGA. The Congress MP also met delegations from ITI, NTPC, UP State spinning mills and Nandganj Sehori Sugar Mill and representatives of primary teachers' association besides a number of local residents who submitted memorandums regarding their problems. Congress General Secretary Rahul Gandhi while talking at a Congress rally in Odisha acknowledged the glorious contribution of his father and late Prime Minister Rajiv Gandhi the upliftment of the youth. The whole world is talking now about the youth of our country. That is because of Rajiv Ji” added Rahul Gandhi “. “But today the state of Odisha is struggling and I am very sad to see the rampant poverty in this state. The conditions are so pathetic”, concerned the young congress MP. Congress President and UPA Chairperson Sonia Gandhi visited her parliament constituency Raebareli to review the process of the central development projects in the region. She met with various people including people’s representatives and officials to take stock of the progress of the works. Referring the Mahatma Gandhi National Rural Employment Guarantee Scheme (MNREGS), among others, Sonia Gandhi stressed for the need of increasing the women’s participation and physically challenged persons in the scheme. The Congress President also met representatives of the district Congress committee, NSUI, Youth Congress, Seva Dal, Mahila Congress and PCC members representing Rae Bareli to get complete feedback on the status of the developmental programmes in her constituency. Sonia Gandhi also interacted with Congress workers and local residents and enquired about their problems. The Congress MP told the people that she would continue working for the development of Rae Bareli. Sonia Gandhi also discussed various organizational matters with the party workers. Sonia Gandhi has always been consistently putting in her best efforts for the development of her parliament constituency. This time during her brief visit she laid the foundation stone of a four-lane Lucknow-Rae Bareli section of a 70-km road and two-lane Rae Bareli-Allahabad section of the 106 km National Highway-24B. The Congress MP added that a Kendriya Vidyalaya would be set up in Rae Bareli's Bachchrawan area. Congress President and UPA Chairperson Sonia Gandhi always believed that education for all is the foremost important factor for development. During her two day visit to her parliamentary constituency Raebareli recently, she had again emphasized that maximum people should get education for the overall development of the country. While addressing the function to lay the foundation stone for the project of strengthening and broadening works of two roads on the National Highway 24 B in Indira Gandhi Auditorium at Firoz Gandhi PG College, Raebareli she also highlighted various polices of Congress-led UPA government at the centre for education. “There is no end for duties and responsibilities in our life and in the similar manner there is no end for the efforts for development of our country. The moment we accomplish a scheme, we can always see new avenues for development. We see new possibilities at each turn. It has been our sincere efforts to design new policies and schemes for the welfare of the people and to make the lives of the people more comfortable,” said Sonia Gandhi. “I talked to a lot of people in Bundelkhand. Many people from Bundelkhand migrate to other cities. Lot of people committed suicide. I feel very sad” said Congress General Secretary Rahul Gandhi. “I feel always happy to be in Uttar Pradesh. I consider UP as my home. But now I am very sad to see the pathetic conditions in the state” said Rahul Gandhi. Rahul Gandhi was addressing a Congress rally in Bundelkhand. The Congress-led UPA Government has made a number of legislations for the welfare of the poor. Out of these the most important one is MNREGA scheme, which guarantees jobs for the poor in the villages, is the most beneficial scheme, said Rahul Gandhi, the Congress General Secretary in Bundelkhand. But the funds send by the centre under this scheme are not reaching the beneficiaries in Bundelkhand, concerned the young Congress MP. The Congress-led UPA Government has made a number of legislations for the welfare of the poor. But the non-Congress state government in Uttar Pradesh is not implementing the central schemes properly and as a result the poor people suffer. We should work together to change this situation, said Rahul Gandhi, the Congress General Secretary in Bundelkhand. The funds send by the centre under this scheme are not reaching the beneficiaries in Bundelkhand, added the young Congress MP. New Delhi: Congress General Secretary and Member of Parli8ament Rahul Gandhi held a meeting of the vigilance and monitoring committee of Amethi district and reviewed the progress of the schemes like MNREGS, PMGSY and Indira Awas Yojana. He was on a two-day visit to his parliament constituency. Rahul Gandhi was reportedly unhappy with the progress in the implementation of these government schemes. He asked the district administration to send its team to at least one village of all the 16 blocks in his constituency for spot verification of the works under MNREGA. Rahul Gandhi has also asked the district administration regarding delay in the completion of repair works on five roads in his constituency. There were also complaints regarding the drinking water scarcity in the region. The young Congress MP reached the Amethi district to review the progress of the central schemes. He also inaugurated a computerised branch of UCO bank at Bhadar village in Amethi. He urged that farmers and women, who are most needy, should be helped with bank loans. Rahul Gandhi also distributed kisan credit cards to some farmers. “I recall my father Rajiv Gandhi’s statement that out of one rupee sent for the development only 15 paise reach the poor. But now I say that even five paise do not reach the poor”, said Rahul Gandhi, the Congress General Secretary in Bundelkhand. The funds send by the centre under various scheme are not reaching the beneficiaries in Bundelkhand, added the young Congress MP. Rahul Gandhi also promised that he will continue visiting the region and also requested the UP Chief Minister also to call on the people in Bundelkhand. Congress General Secretary and MP Rahul Gandhi inaugurated UCO bank branch in his Parliamentary constituency Amethi during his two-day visit to Amethi. He urged the banks to help the poor whenev3er they require any assistance, especially in the case of loans. Striking an emotional chord with the people of Amethi, the Congress MP continued, “I want the poor in the villages also should be able to get the modern facilities. It is very easy for the elite and rich people to get bank loans but the poor people face a lot of hardship to secure a loan. This issue should be addressed seriously”. Rahul Gandhi then requested the bank officials to help the poor in the region whenever they require any help from the bank, especially in the case of loans. “I request the bank officials to help the poor in the villages to secure easy loans. I also request that the women as well as the farmers here, who put in their sincere efforts for the development of the country, also should be able to get the loan facility without difficulties”. “Our country move forward only because of the hard work of these poor people. So please help them because their services are selfless”, concluded the Congress General Secretary. The Congress leader also attended the district monitoring and vigilance committee meeting at the collectorate.